There's been tributes to The Byrds, The Buffalo Springfield and The Hollies. There's been several tributes to Neil Young. There's even been a tribute to Graham Nash's album "Songs For Beginners". But there has never been a tribute to the collective work of Crosby, Stills, Nash & Young. 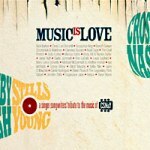 Until now: "Music Is Love - A Singer-Songwriters' Tribute To The Music Of Crosby Stills Nash & Young"! The album features not only several musicians from the inner circle of CSN&Y (Stephen Stills' former girlfriend Judy Collins and daughter Jennifer Stills, Anthony Crawford and Rick Rosas from Neil Young's Electric Band, Sonny Mone from Crazy Horse, David Crosby's guitarist Marcus Eaton and vocal favorites Venice), but also some cool names from the 70's (Karla Bonoff, Elliott Murphy, Willie Nile, Wendy Waldman), some interesting names from the 80's (Sid Griffin, Ian McNabb, Liam O'Maonlai, Steve Wynn), as well as some new-up-and-coming names from the alt country scene in the U.S. (Clarence Bucaro, Neal Casal, Carrie Rodriguez). Thanks to Sweden's Hemifrån we are able to raffle off several 'Music Is Love' CD's. Competition closed! Cilla Fisher (*26. September 1952, Glasgow, Scotland.). The Scottish singer, whose siblings Archie and Ray were among the first professional folk singers in Scotland, made her musical debut on BBC Radio Scotland at the age of 9. She started performing with husband Artie Trezise as a folk singing duo in 1974. Their first venture under the title "The Singing Kettle" was a children's album in 1982 with a distinctly Scottish flair. The idea came of turning the album into a show, as they were unimpressed by other children's theatre shows at the time. The touring show eventually developed into a more plot-led piece of musical theatre and they successfully began performing in large scale theatres across the UK. 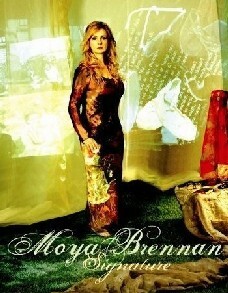 Moya Brennan (*4. August 1952, Gweedore, Ireland). Irish singer and harpist Máire Philomena Ní Bhraonáin — since 2002 she has promoted herself as Moya Brennan, a spelling closely resembling the phonetic pronunciation of her name — grew up as the eldest child of a very musical family in the Gaeltacht area of Gweedore (Gaoth Dobhair) in Ireland's northernmost county, Donegal. Moya sang along with her siblings in the family pub, Leo's Tavern. After leaving secondary school she studied harp, piano and singing at the Royal Irish Academy of Music in Dublin and eventually joined her two brothers Pól and Ciarán and their mother's twin brothers Noel and Pádraig Ó Dúgáin and formed the group Clannad in 1970. 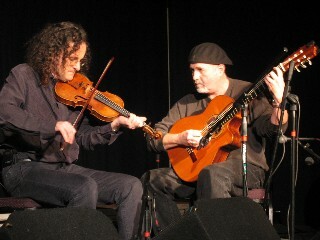 Clannad is credited with the creation of contemporary Celtic music and is held in high esteem for bringing new life to old Irish songs. Moya's ethereal vocalisation is considered the archetypal sound of Ireland and she has provided music for several soundtracks, including "Titanic" and "King Arthur." "Treasures from the Folk Den"
Roger McGuinn (*13. July 1942, Chicago, Illinois, USA). The American singer-songwriter and guitarist is best known for being the lead singer and lead guitarist of the folk rock group The Byrds. The Byrds had two number one singles with Bob Dylan's "Mr. Tambourine Man" and Pete Seeger's "Turn! Turn! Turn!" in 1965. McGuinn developed two influential styles of electric guitar playing, the jingle-jangle ringing arpeggios based on banjo-picking styles and the merging of saxophonist John Coltrane's free-jazz atonalities which hinted at the droning of the sitar ("Eight Miles High"). In 1968, the Byrds recorded "Sweetheart of the Rodeo," the first fully fledged country rock album. After several personnel changes, notable band members included David Crosby and Gram Parsons, the group disbanded in 1973. McGuinn released several solo albums and has used the Internet to continue the folk music tradition since 1995 by recording a different folk song each month on his Folk Den site. Peter Rowan (*4. July 1942, Wayland, Massachusetts, USA). The bluegrass singer-songwriter has a career spanning over five decades, initially starting on rockabilly and blues music. After hearing The Country Gentlemen and The Stanley Brothers Rowan discovered bluegrass and was hired by Bill Monroe as the lead singer and rhythm guitarist for The Bluegrass Boys. He recorded a total of fourteen songs with Monroe between 1965 and 1967. Since then, Rowan has been involved in various group and solo projects. "Fire in the Kitchen", "Tears of Stone"
Raylene Rankin (1960-2012). The Cape Breton singer passed away on September 30th after a long battle with cancer. Raylene, who had trained as a lawyer, burst, with four of her eleven siblings from the small village of Mabou, Nova Scotia, into the spotlight in the early 1990s as a member of the acclaimed group The Rankin Family. The Rankin Family sold more than 2 million records and won many Canadian music awards. In 1999 they went their separate ways, John Morris Rankin died a year later, the remaining members, including Raylene reunited in 2007. Raylene also released two solo albums, the latest, "All the Diamonds," came out only in 2011. Isabel Vargas Lizano (1919–2012). 'Chavela' Vargas, la voz áspera de la ternura (the rough voice of tenderness) died on 5 August 2012. She was born in Costa Rica, but emigrated to Mexico at the age of 14. She sang in the streets as a teenager, dressed as a man, smoked cigars, drank heavily, carried a gun and was known for her characteristic red jorongo. In the 1950s Vargas became famous for her rendition of Mexican rancheras (love songs which are usually performed by men). Vargas recorded over eighty albums and had been featured in many films of Pedro Almodóvar. Music Export Finland and the Finnish Music Information Centre Fimic teamed up. Music Finland, the new organization, picks up where these two dedicated organizations left off – with a refreshed feel and as much passion and enthusiasm for Finnish music as ever. Music Finland’s new website offers service in both Finnish and English. Music Finland is the new organization dedicated to promoting the success and awareness of Finnish music at home and abroad. Music Finland creates and manages a wide variety of services, marketing programs, events, networking opportunities, training, consultancy, support, research, information and funding programs. These activities aim to maximize success for Finnish music and music companies, and increase Finnish music export revenue. Clare County Library, in association with The Clare Arts Office, has announced the launch of its online Music of Clare project on the library’s website. The first stage of the project concentrates on the traditional music of the county and featuring the biographies and music of some of Clare’s best known traditional music artists, including Martin Hayes, Micho Russell, Willie Clancy, Sharon Shannon, Chris Droney, Dennis Cahill, The Kilfenora Céilí Band, Martin Junior Crehan, Elizabeth Crotty, Kevin Crawford, Kieran Hanrahan, The Tulla Céilí Band and Kitty Hayes. 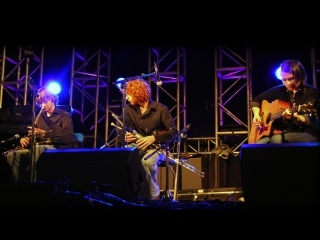 The project also includes a Music Videos feature, a collection of embedded online videos of Clare musicians from YouTube. Historical and biographical articles place the music of Clare in context and provide background and further resources for study and enjoyment. 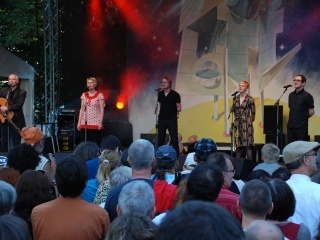 WOMEX is proud to announce the winner of the WOMEX 12 Artist Award: Värttinä from Finland. "Let's go back nearly 30 years to a small town in Karelia in Eastern Finland where a mother is teaching her young daughters ancient Karelian poetry and songs to the accompaniment of the zither-like kantele. Soon they are joined by other local children bringing their own array of instruments and ideas, accordions, saxophones, guitars, bass, fiddles and flutes. What had started as a mission simply to revive ancient traditions gathered energy and these songs and poems developed a new life in the hands of hugely talented and imaginative young people. A few years later they had a national reputation and were named Band of the Year at the prestigious Kaustinen Folk Festival, the first of what was to turn out to be a whole catalogue of awards and accolades. Sometimes it's the case that good things don't travel so well outside their homeland but Värttinä was about to take the world by storm. They had become a band of outstanding instrumentalists, composers and arrangers fronted by three singers who ensnared us with their beguiling harmonies, voices which seemed so new, so different to anything else, and whose stage presence was brilliantly uncompromising. They became one of Finland's greatest global ambassadors, playing to thousands at festivals and venues around the world, building a massive fan base, inspiring audiences, other musicians, directors and producers, including AR Rahman with whom they worked on music for the stage version of The Lord of the Rings. They have released 14 albums, received awards for Best Album in different countries. Yet Värttinä is far more than a 'world music hit'. They have constantly looked at their roots afresh, taken their music in many different directions, never afraid to test their traditions out against new musical backdrops taking on board ideas and sounds from the new members who've joined over the years. But they have always remained simply Värttinä, a band which has cast its ancient spell upon our hearts for 30 years." WOMEX is also proud to announce the winner of the WOMEX 12 Professional Excellence Award: Alexander "Sasha" Cheparukhin from Russia. "The WOMEX Award for Professional Excellence is not just a small way to give praise to someone who deserves recognition at the highest level for a lifelong contribution to our community. It is also an opportunity for us at WOMEX to think about the values that we try to uphold. In honour of this turbulent past twelve months - in which not one of our countries has been untouched by social and political tensions - the Award this year goes to someone who underlines those values that we at WOMEX seek to uphold – a deep awareness and respect for our environment, a constant desire to expand boundaries, and an unfailing dedication to freedom of expression on every level. Artistic director, activist, musician and tour producer Alexander "Sasha" Cheparukhin was born in Sevastopol, USSR (now Ukraine) in 1958. He has had three distinct careers: as an environmental activist, as a journalist and as a music professional. His activities have ranged from leading the Association for the Support of Ecological Initiatives; leading demonstrations at Soviet nuclear power plants; interviewing Boris Yeltsin and reporting from inside the White House in the 1993 siege; managing Huun Huur Tu and leading them on tours worldwide; commissioning international collaborations for leading Russian artists like the Pokrovsky Ensemble; helping the city of Perm to transform its international reputation in an unprecedented dedication to cultural activity; and staging concerts supporting freedom of expression in some of Russia's most rigid political environments." "That's it then, it's the end. with neither a whimper, a bang or a reunion. Thirty years of ideas and melodies, endless meetings and European tours, press releases, singalong choruses and Dada sound poetry, finally at an end. It's hard to sum up why without sitting you down one at a time and having a proper conversation, but that'd take too long. So, in as few words as possible, here goes. We felt we'd got to a point where what we did as a band - and specifically the writing, recording, touring cycle - wasn't doing justice to what Chumbawamba set out to do in the first place. We were always as much about ideas as music, and that meant doing more than writing, recording and touring songs. It meant trying to be relevant and active and up-to-date, while trying to avoid the dreaded rut of routine or repetition. being up-to-date meant giving plenty of time and energy to the band, constantly, for those thirty years; a constancy we plainly couldn't keep up with in the end. Chumbawamba was our vehicle for pointing at the naked Emperors, for telling our version of the truth; it gave us more than the joy and love of playing live, writing songs and singing together - it gave us a chance to be part of a broad coalition of activists and hectors, optimists and questioners. But eventually the rest of our lives got in the way and we couldn't commit the time and enthusiasm that the band demanded. Couldn't keep up with whatever responsibilities came with a band like this. If there were ever a Chumbawamba manifesto, it would read in the inconsistent, contradictory language of the Dadaists - part strident belligerence and part foolishness. This ending is no different; it comes almost as much of a surprise to us as it may do to you. Always more clown than politician, the band trips over its outsize feet and performs its final tumble. There have been squabbles and arguments along the way. A deal of griping, frustration, moaning, exasperation - but always alongside a huge amount of goodwill and generosity, good humour and love. What a riot it's been, frankly. And now it's time to clear up the mess and move on. So, sometime before the end of our thirtieth year - 2012 - we'll play a few final times and then we'll hang up our guitars, trumpets and football rattles. We'll worry that we've made the wrong decision, and we'll wonder why we're throwing away something with so much potential, especially at a time when this country needs all the truth-telling it can get. But we'll be coming to a stop knowing that we can look back on it proudly and smile at what we all did together. A quick and inadequate thank you to everyone that played some part in all this, the band members and labels and agents and the rest. And thank you to the people who supported the band, followed the unannounced twists and turns, dipped their toes in, and even those who ditched us after one too many of our bizarre route-choices. We do hope that somewhere along the way we've been able to pass on some of that musical finger-pointing to others. However much we wanted to mess up our career options with all those bouts of chopping and changing, we relished a role as a band that could use music to pass on information. Songs as history lessons or cultural debates. If others have been inspired to switch off the telly and do something useful because of all this, then that will be our measure of success (more of a measure, in any case, than record sales). We'll carry on working outside the band, sticking our necks out, getting involved and mucking in. Part of the reason we couldn't devote enough time and effort to Chumbawamba was being already involved in all the stuff of life that wasn't the band. So yes, we'll probably see you around somewhere. Maybe now people will stop asking if the electric band is getting back together… but probably not. Maybe one of you lot can organise a tribute band and play at our local pub. Go on, it'll make the surreal absurdity of our 30 years complete. We do, of course, reserve the right to re-emerge as Chumbawamba doing something else entirely (certainly not touring and putting out albums every 2 or 3 years). But frankly, that's not very likely. Thirty years of being snotty, eclectic, funny, contrary and just plain weird. What a privilege, and what a good time we've had." 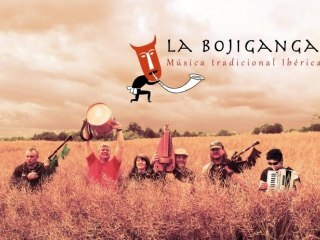 LA BOJIGANGA (i.e. travelling minstrels) is a band that since 2011 has been on the road, performing traditional songs from several parts of Spain, Portugal, France and the Sephardic (Spanish-Jewish) tradition. So far they have mostly played in towns and villages in the mountain chain near Spain’s capital city, Madrid (Sierra del Guadarrama).